The Bucks Free Press has revealed Wycombe Wanderers are actively seeking investors to inject money into the Club. The story was based on comments made by Club Chairman Ivor Beeks to over 100 local business people at the first of the Club's new 'Breakfast 2000' business meetings at Adams Park on Wednesday (26th January). Beeks said "We are trying to get the whole package in place first so that members know what they are voting for" He went on to add "We believe we will have to form a new private limited company with new investors" This is the first public airing of the Club's intention to bring in an external source of cash and one that is really a separate issue to the previous attempts to change the constitution of the Club. The revelation by Beeks came a day before a one day conference held in London where top football officials, along with representatives of supporters clubs, discussed ways of setting up trust related ownerships of football clubs. Bournemouth have gone down this route and many clubs have already approached The Cherries for guidance in setting up similar schemes. Any change to the current constitution of the Club would require a 75% majority vote in favour by the 500 members. Jamie Bates has undergone an operation on the ankle he injured during the Colchester v Wycombe clash early this month. Bates has had a small piece of bone removed that was aggravating the healing process and is now likely to be out of action until early April. Wycombe's trip to Southend United on Wednesday evening in the Avon Insurance Combination ended with a 4-3 reverse. Playing against a reasonably strong Southend side, Wycombe took the lead in the seventh minute when Dannie Bulman converted a right wing cross from Maurice Harkin. However, Wycombe conceeded two goals in five minutes just after the half-hour mark when Fitzpatrick and then Clark scored for the home side. Cross extended United's on the stroke of 45 minutes but Harkin reduced the deficit straight from the kick-off when he clipped in a Martyn Lee left wing cross at the near post. Southend regained their two goal advantage in the 76th minute when Cross scored his second but two minute later Danny Senda took the ball around United 'keeper Mark Prudhoe to make the score 4-3 to Southend. Terry Gibson was an unused substitute for Wycombe at Roots Hall in what was quite an encouraging display by The Wanderers. Wycombe Team: Westhead (sub 73 Osborn), Reekes (sub 73 Townsend), P Johnson, R Johnson, Beeton, Lee, Harkin, Holsgrove, Senda (sub 79 Gostick), Thompson, Bulman sub not used Gibson. The Club are planning to increase the capacity of the Hillbottom Road End by around 1,000 to take the total capacity of this area of the ground to approx 2,000. However, due to minor changes in capacity levels in other areas of the ground, the proposed changes will not result in the overall capacity of Adams Park being increased above the current 10,000 figure. If the planning application is successful, the Club plan to complete the work during the close season. The Club seated this area of the ground at the start of the 1996/97 season but have consequently suffered from a shortfall in revenue when visiting teams have wanted more than their allocation allows. A controversial penalty six minutes from the end of normal time ended Wycombe Wanderers Youth Team interest in the FA Youth Cup at St James Park on Thursday evening. A spirited display by the youngsters looked like earning a 0-0 draw and a replay at Adams Park but when Ben Townsend clipped England Schoolboy Michael Chopra in the penalty area, the referee surprised almost everybody when he pointed to the spot. Wycombe were never outclassed in the daunting suroundings of St James Park and had chances through top scorer Leeyon Phelan and Ian Simpemba to win the tie. Newcastle, semi-finalists in last season's competition, go on to meet Sunderland in the next round. There was more card trouble for Wycombe at Colchester on Tuesday evening (18th January) when Michael Simpson and Steve Brown were sent-off for second bookable offences. Martin Taylor and Dannie Bulman also went into referee Keith Hill's book to take Wycombe to over 50 bookings in all competitions this season. Wycombe are sitting on a �20,000 suspended fine from the FA and last July, Lawrie Sanchez said "We have got to clean the situation up and we will. We don't want want to be spending our money on fines to the FA". Wycombe accumulated 109 bookings last season and unless there's a dramatic clampdown on the discipline front, it look's like another day in front of the FA, with another large fine looming. Who's the dirtiest team in the Football League? Is it Wycombe? Is it Colchester? No chance!! Find out from our friends at Opta. Jermaine McSporran could be out for six weeks after suffering an appendicitis on the Friday before the home game with Scunthorpe on Saturday (15th January). McSporran was admitted to hospital the same day and will spend the next few weeks recovering from the operation. Wycombe were dumped out of the AutoWindscreens Shield after a penalty shoot-out was needed to settle the tie against Oxford United at The Manor Ground on Tuesday 11th January. The game had ended 1-1 after 90 minutes and when a further 30 minutes of extra-time didn't bring the 'golden-goal' it was down to the dreaded spot-kick scenario. Andy Baird saw his penalty saved as the home side converted all five of their kicks to go through to the next round. Lawrie Sanchez made five changes to the side that drew at Millwall the previous Saturday - leaving out Sean Devine, Dave Carroll, Jason Cousins, Jamie Bates and Keith Ryan. Full match details. The Quiz Night on Wednesday 12th January organised by The Independent Supporters Club raised more than �300 for Gary Goodchild's Youth Team. The event held in The Keen Lounge at Adams Park was well attended with practically all the Youth Team turning out along with various club officials. A team consisting of three contributors to Chairboys on the Net won the quiz - who said we're just a bunch of sad anoraks! With the help of Wycombe District Council, Buckinghamshire County Council, Motts Travel and Wycombe Bus Company, the Club have arranged a revised matchday bus service to Adams Park. With the exception of just a few stops all pick up points have been covered. Full details and times available from the Wycombe Wanderers Official Website. Paul McCarthy was eased gently back into the Wycombe team when he appeared in the side that beat Chesham United 4-1 at Adams Park on Tuesday evening (4th January) in the Berks and Bucks Senior Cup Third Round. 'Macca' hadn't played since he was injured in training back in September but came through unscathed alongside Mark Rogers. Wycombe won thanks to a hat-trick from Richard Thompson plus a strike from new signing Matt Brady. Wycombe saw in the new year with a 3-0 victory against bottom of the table Chesterfield at Adams Park on Holiday Monday. Sean Devine netted two more goals to take his Football League tally to fifteen. Wycombe welcomed back the suspended Jermaine McSporran, Jason Cousins and Michael Simpson, although Andy Baird and Steve Brown sat out the game with one match bans. Lawrie Sanchez gave a full debut to Danny Senda while new signing Matt Brady was made his First Team debut when he came on as sub. Gary Ablett has ended his one month loan spell from Birmingham City but has since been released by the Division One side. He'll be available on free transfer and Walsall are already reported to be interested. A permanent move to Wycombe is unlikely due to the wage aspirations of the experienced defender. 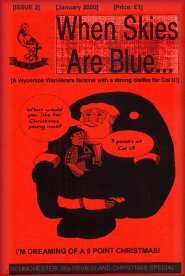 A new issue of Wycombe fanzine One-One went on sale for the first time before the Chesterfield game (priced 50p) while issue two of the When Skies Are Blue fanzine, is also still available, priced �1. The Wycombe Wanderers Official Website was re-launched on Holiday Monday (3rd January 2000) thanks to the help of Paul Lewis from Chairboys on the Net. The Club approached Paul to discuss ways of improving in the site and the outcome has been that Paul has become Webmaster for the site and will be responsible for updating the site with content provided by the Club and adding match details shortly after the final whistle of First Team games. Speaking about this, Lewis said "This is certainly an exciting opportunity for the Club to continue their commitment to communicating with the fans and with the experienced gained from producing COTN for the past four years, we can offer a good mix of internet and fan based knowledge to the Club." He also stressed that "COTN will remain unaffected by the changes to the Official site and more importantly will allow COTN to concentrate more on fan related issues in addition to our usual unique content. As ever we welcome any feedback and will develop both sites based on your suggestions".